Eel has troubles of his own: As an orphan and a "mudlark," he spends his days in the filthy River Thames, searching for bits of things to sell. He's being hunted by Fisheye Bill Tyler, and a nastier man never walked the streets of London. And he's got a secret that costs him four precious shillings a week to keep safe. But even for Eel, things aren't so bad until that fateful August day in 1854 -- the day the Great Trouble begins. Mr. Griggs, the tailor, is the first to get sick, and soon it's clear that the deadly cholera -- the "blue death" -- has come to Broad Street. Everyone believes that cholera is spread through poisonous air. But one man, Dr. John Snow, has a different theory. As the epidemic surges, it's up to Eel and his best friend Florrie to gather evidence to prove Snow's theory before the entire neighborhood is wiped out. 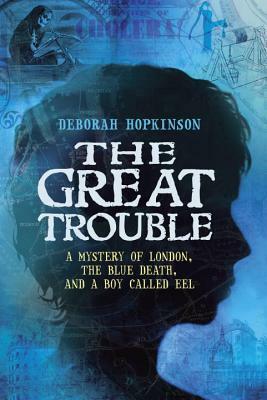 Part medical mystery, part survival story, and part Dickensian adventure, Deborah Hopkinson's The Great Trouble is a celebration of a fascinating pioneer in public health and a gripping novel about the 1854 London cholera epidemic.